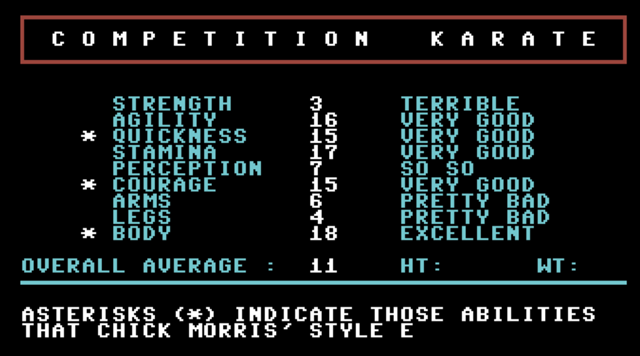 Competition Karate is a simulation game written by Edward Badasov and ported to Commodore computers by Malcolm Low and Michael Sokolewicz. It received a commercial release by Motivated Software in 1984, and has just been released for the first time as a digital download on CSDB. As well as the usual training modes, the game has had some rework including bug fixes and detailed documentation, which you'll definitely need to get the most out of this game. Although BASIC games generally don't age too well (and usually weren't too good in the first place), I found this game to be surprisingly playable. Normal game mode requires setting up of characters to fight with RNG stats created by hitting the fire button, but you can also get straight into the fight by opting for demo match. Multiple players can also take part in competition matches, which involve a quite sophisticated tournament simulation. 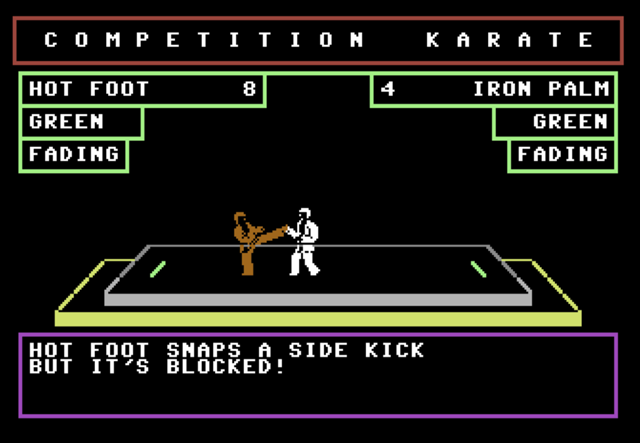 While matches consist of pulling the joystick in different directions and hitting fire when your character is highlighted. Numbers will pop up to show what move you are making, and you watch the outcome by watching the player sprites carry out your selected moves and also a text commentary displayed below. You can also save your game to a blank disk, which is necessary to avoid "Device not present errors" popping up at runtime and breaking you into the BASIC listing. 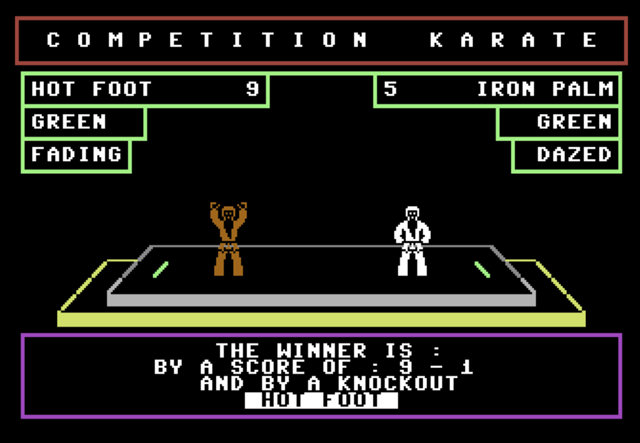 While not the most thrilling fighting game released on C64, pulling off a successful combo of punches and kicks is still rewarding. And simulation mode has the potential to provide a much deeper game experience for those willing to look past the rudimentary UI and graphics.